For a couple of years now, we've rented a cabin for Thanksgiving, just my family. This year, we've been joined by my in-laws. So we're a full house. Most of this bunch is still asleep, so in the quiet before I start cooking (any more than toast and tea right now) I was taking time to think of all the things I'm grateful for. Well, I'm also going to grade papers because I would be most thankful to be done with them, but I digress. It's a long list, but as I watch Thing 4 clear some of last night's tea cups out of the living room oh so carefully, one blessing comes clearly to mind. The drive up was worse yesterday than in earlier years because we left later and hit both rush hour and holiday traffic. We were well and truly crawling along when from the back of the van I heard those words: "I really have to pee!" An older child might have gotten the You Should Go When You Have A Chance lecture, but the two year old just gets "Hang on, honey, we're looking for a potty!" There was an exit directly ahead of us, and I just had to change lanes and skim along the shoulder for a little bit, not actually reaching warp speed before landing at the intersection and turning right into the nearest gas station. As I jumped out of the driver's side to run around and free her, right behind me sat a motorcycle officer, lights flashing. He said, "Well, do what you have to do," and I grabbed her and ran to the bathroom, leaving him sitting there. The whole time I was holding and wiping and telling her what a big, wonderful girl she was for holding it -- I do love me a potty-trained child -- I was worrying. My driving record was so far free of moving violations. How was I going to face this cop while holding my (evertalking) child? All done, we left the bathroom to face the music. My spouse hadn't talked to him. My father in law had no idea where he'd gone. The kids hadn't seen anything. This isn't one of those spooky stories where a cop was killed there in previous years. I suppose either he'd gotten a higher-priority call, or decided that my hurry which had propelled us through a red right hand turn light was, in fact, legitimate -- maybe he has a toddler? -- or something. Anyhow, there is gratitude for the missed bad things as well as those blessings which we have received. The hippie dream koolaid yarn is done and plied. For some reason, there is no way for me to spin two bobbins at the same diameter. We'll see what effect that has on my budding sock yarn. Meanwhile, I'm going to spend my holiday finishing (hahaha) The Pearl Buck Swing Jacket and maybe knitting up something for Thing 3. He's the one most sweaterless and I scored some Debbie Bliss Cashmerino for his sensitive skin. Oh, and grading papers. Lots and lots of papers. Hooray for employment! If you're celebrating, have a great holiday. Thanks to Needledancer, I have a post. 38 things to post, in fact. 1. Name one person who made you laugh last night? The almost-teen in the house. I was debating with spouse whether or not my new crank sock machine was a replica of an antique or a new machine -- we know it's newly made, but the design hasn't changed in 100 years -- and I said, "It's not an antique. . . " and the kid said, "Just works like one?" I had been swearing at it just moments before. 2. What were you doing at 0800? putting the makings of breakfast burritos on the table and yelling upstairs, "Breakfast is ready! You asked for these; come and eat them!" 3. What were you doing 30 minutes ago? Posting answers to my online students' discussions. 4. What happened to you in 2006? I designed and knit a cabled sweater for Thing 1, the baby started walking and talking, and just plain old daily life happened -- a lot! 6. How many beverages did you have today? A cup of Earl Grey tea. 7. What color is your hairbrush? If I can find one, purple. 8. What was the last thing you paid for? Food -- the biggest grocery shopping trip in recent memory. 9. Where were you last night? At home, working, working on the cranky sock machine and putting kids to bed. 10. What color is your front door? Peely brown stain and glass. It's an old double door. 11. Where do you keep your change? In an envelope marked "Mama's stash money." I'm saving for a fiber festival. 12. What’s the weather like today? high 60's and sunny. 13. What’s the best ice-cream flavor? Coffee Heath Bar Crunch. I just wish they'd use coffee-er ice cream and more chunks. 14. What excites you? Fiber fiber fiber. Gardening. My kids. Going somewhere with just my sister. Being read to at night. 15. Do you want to cut your hair? No. I want it to grow much longer. 16. Are you over the age of 25? Snort. 17. Do you talk a lot? Probably. 18. Do you watch the O.C.? No. Pretty much don't watch anything. 19. Do you know anyone named Steven? I have a half brother and a cousin with that name. 20. Do you make up your own words? I use the ones the kids do mostly. 21. Are you a jealous person? I try not to be. I have many other besetting sins. 22. Name a friend whose name starts with the letter ‘A’. Anita. 23. Name a friend whose name starts with the letter ‘K’. Katherine. 24. Who’s the first person on your received call list? Eric. 25. What does the last text message you received say? The only entity who texts me is my phone company. See item #16 for an explanation of this phenomenon. 27. Do you have curly hair? Although it's been curlier, my mental picture of me is very curly. 28. Where’s the next place you’re going to? After the kitchen, to make the offering for the potluck, probably IKEA for cheap ice cream dishes for one of the parties. 29. Who’s the rudest person in your life? 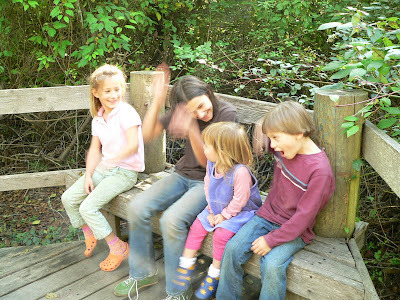 Any one of my kids, in varying turns. My nephews are right up there, too. 30. What was the last thing you ate? One of those breakfast burritos. 31. Will you get married in the future? Um, if I'm widowed? Right now I think once is enough. 32. What’s the best movie you’ve seen in the past 2 weeks? I've been watching the Hornblower series but don't remember going out to the movies. 33. Is there anyone you like right now? Like? Like-like? Well, yeah, you don't get four kids and a daily shower pal without it. 34. When was the last time you did the dishes? Last night. I even washed mixing bowls and a pot. 35. Are you currently depressed? No, although I have a friend who often tells me I am. I believe it's because that person can't believe I'd actually choose this life. 36. Did you cry today? No. I don't think it's in my plans for today. 37. Why did you answer and post this? I'm feeling guilty for not blogging. 38. Tag 5 people who would do this survey. Since only 5 people currently read my blog, consider yourself tagged if you did. I began dating my husband after making a solemn vow to stay single, and maybe only spend time with people I already knew. Bam, just like the universe was listening and perhaps chuckling a bit, spouse and I went out on Valentine's Day, on not-a-date-thankyouverymuch, during which he casually informed me I should marry him because, and I quote, he was "the perfect guy for [me]." Some people find that story horrifying, like he was a secret control freak, and some people seem to understand why I find it so funny. As far as there is a "perfect" person for people, we probably are to each other, and as far as not-dates go, that one was okay. 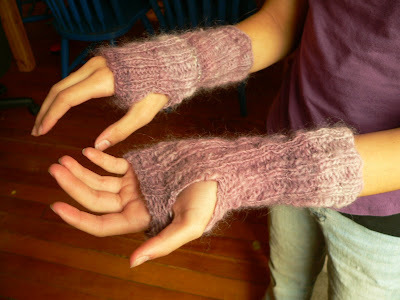 All this to point out that when I got very comfortable with not doing things, my three-course class session ended, I got some creative urges, and Thing 1 asked for some wristwarmers knit out of "her" yarn. 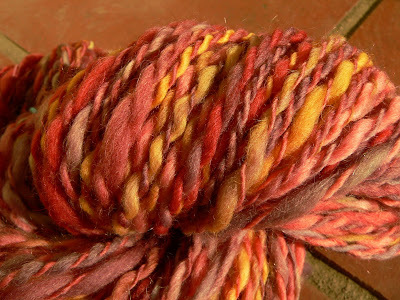 "Yarn," that is, after I spun up the roving she'd dyed with Kool-Aid. Pattern, dead easy. Either knit ribbing in the round or flat, and switch to back-and-forth if you're doing in the round for the size of a thumb hole, or seam it up with the same omission. One could, presumably, pick up and knit a thumb, but these aren't meant for Real Winter, just our chilly days -- and without heat in the house, we have them indoors! Now Thing 3 is asking for something else out of his "yarn." I have no idea what it will be. So inspired, I thought about spinning some more yarn to put in my friends' yarn store. 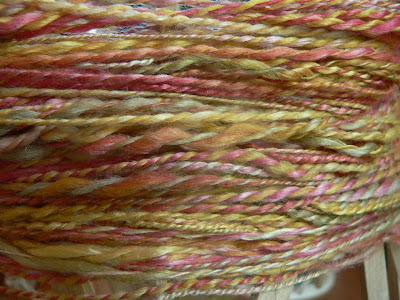 I may overdye this stuff -- it was my first dyeing with sunflowers experiment -- or not. In the middle of spinning, I realized that I had to purchase candy for tonight (I do not keep it in the house for reasons of willpower, lack of, my own) and figured I'd pick up some Kool-Aid while I was out. I hope this stuff doesn't spin up into what looks like a hippie acid trip, but you never know until you try. I may end up ordering more leftovers from the Sheep Shed if this spinning thing keeps up. What fun. Oh, and while you're enjoying tonight's festivities if you do tonight, please spare a thought for Zipper, Thing 2's snake. He escaped his cage and the house is quite cold. We know he's here somewhere, but I'd like to get him back where it's nice and warm. Autumn has always, always been my favorite season. Even when I was growing up in a state where "Fall" meant "tear another page off of the calendar, you can't tell any other way," I knew when it really happened. Maybe it's day length sensitivity or something. Later, living somewhere with a cliched greeting-card version of the season, I almost got hit by cars walking along looking up at trees (changing!) and clouds (scudding!) just sort of humming happily to myself. Probably equinox-drunk. And it's happening again now, only I'm a little confused because there wasn't much "summer" to indicate that "fall" would be the coming attraction, and anyone who has ever watched a movie with me knows that I'm all about the previews. And I still love it. But lately, it's become clear that not only am I not going to make twelve sweaters this year, I may not knit again this year. Combinations of stress have just driven any knitting sort of underground. Lots of work, which is a blessing; my dad has been doing the hospital/rehab place roller coaster, which is also a blessing, in many ways; watching those around me deal with their own troubles in graceful, attractive ways has taught me so much -- hey look! another blessing; and the kids are terrific and very very busy. 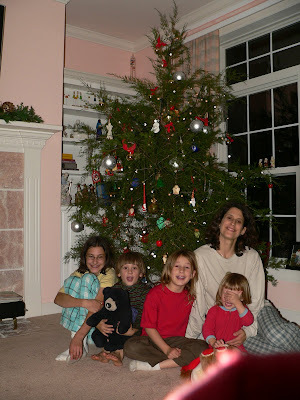 Blessings all (easier to say now that they're asleep). Instead of fighting it, which I do sometimes, the concept of letting this lay fallow is growing in me. Spinning has become my evening activity of choice, when I'm not ferreting out blatant plagiarism, and the soothing pull of the yarn and the sliding of the fiber heal whatever is jagged from the day. I even spun in public the other day, horrifying Thing 1, but fascinating everyone from little kids to old people. While I'd rather be finishing the sweaters begun earlier, and I'd love to be casting on for new projects, it's probably better not to fight the inevitable. In the garden, for example, it's time to plant lettuce and kale, to rake over the old beds and put in the carrots. To plant tomatoes and melons now would be to doom them to misery. Likewise, if I rushed my still-healing body into the gym and pumped weights as though there had been no hiatus, I'd become seriously laid up. Waiting and listening have their own wisdom, and I'm lucky to get to be still in the middle of doing a lot and receive them. 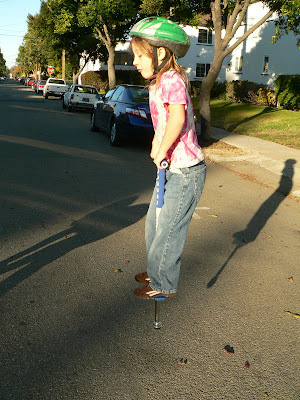 I'm trying to work on balance in my life. Balanced plying, balanced work and play, balanced computing and . . . real life. 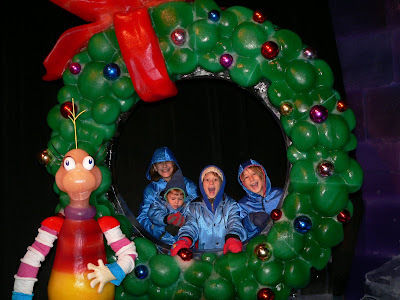 So I'm not going to post or read bloggy things until September. I hope to use those reclaimed hours to knit some stuff. A gal can dream, you know? I hope you all have a great month! One of the first things I did this morning was to grab some of the fiber and just feel it again. this is the baby alpaca. While some of this is due to operator limitations, pictures just don't do it justice. It's very very soft. I think I'm going to spin it right from the lock, over the fold, to try to preserve some of the loft and not make a hot tight yarn. It's very clean and a little test spin went beautifully. 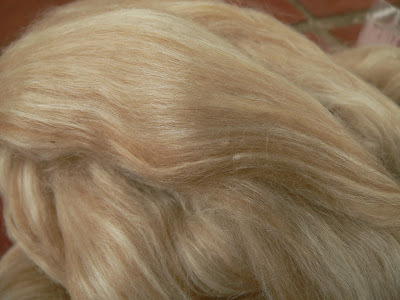 This is the Corriedale. It, also, spins beautifully. Just a good basic wool. Aaaaaaah. 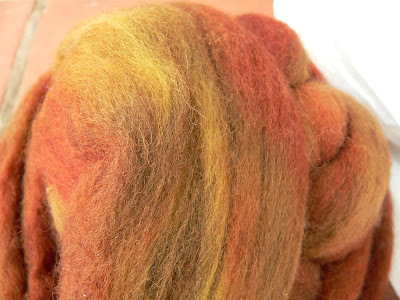 I think I'd call this baby camel/silk colorway "Thing 2's hair," although it's even finer. But the streaks remind me of a summer blonde. Maybe that would be a better name. 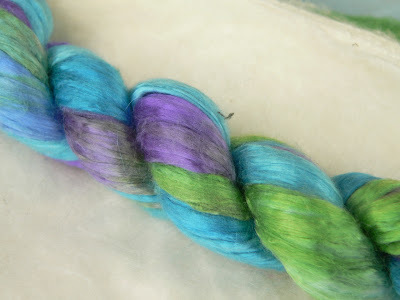 This silk colorway is "Lake Berryessa." The real lake doesn't look so much like this, but maybe I'm not that familiar with it. So that's it. Sunday morning pretties. Now I get to catch up with the work I didn't do yesterday. But first, some of the spinning I've been doing. I finally got to the Guatemalan indigo. It's plyed now, and I think I've probably earned my Merit Badge in "overplyed." Should wear like iron. I'm getting roughly 100 yards (hee -- I typed yarnds - a new measurement unit!) per ounce, ounce and a quarter. 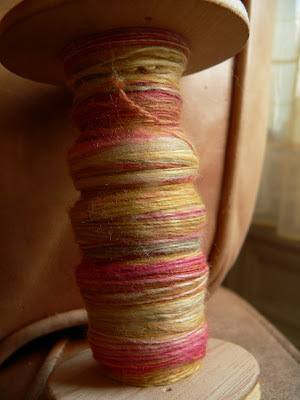 That cochineal yarn is there to demonstrate how far my spinning has come, in just a little bit. The yellow isn't as even, and it's older. 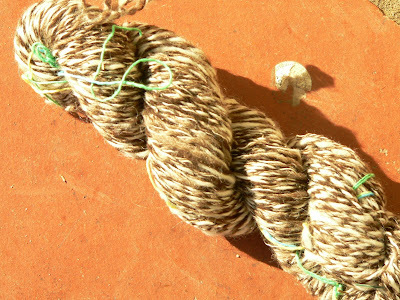 One of the things I'm most struck by is how harmonious the natural dyes are with one another. 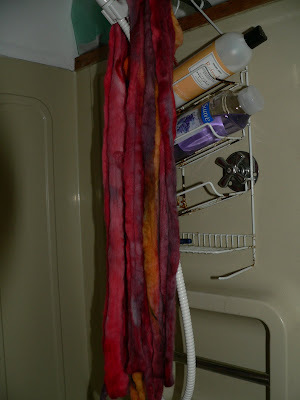 I'm looking forward to trying some more when the dyeing wool shows up from Susan's Fiber Shop shows up. Little bits of yarn spun up are feeling frustrating for me. I'm just not a sock knitter. 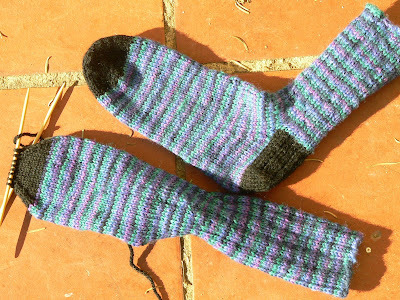 Know anyone who would love to knit socks from handspun in exchange for homemade bread or more handspun? That might give me sock spinning incentive. I do, however, have largish feet -- pushing a US size 10. Lambtown -- well, it was fun. I found it a hair overwhelming, and since it was a smallish do, I bet that would really be something. Today was all about the soft. There were so many soft things to touch. And I may be in a color rut, as everything I dallied over was caramel, brown, green, tan. . . You get the picture! 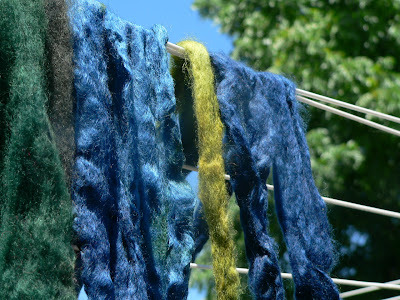 I saw local blogger and fiberista Kristine today, along with Michele from dyeing class. It was nice to see friendly faces. I also tried wheels (with help) at the Carolina Homespun booth. I liked the Lendrum a lot. So did Thing 4, but she didn't get what you'd call a real trial on it. Oh, also a pattern for a beautiful leaf shawl leapt at me, in a triumph of fondness over experience. Thing 1 said, "Hey, look at this pretty shawl. I like it." Maybe when she graduates from something adult, it will be done. 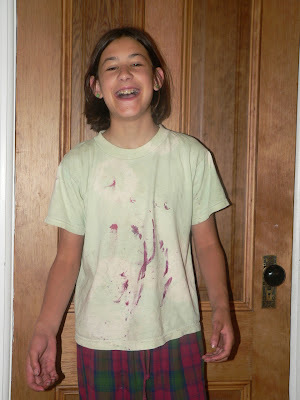 She said her dyeing class was "okay." Hot and grumpy by the end she was. My silk class wasn't what I expected. 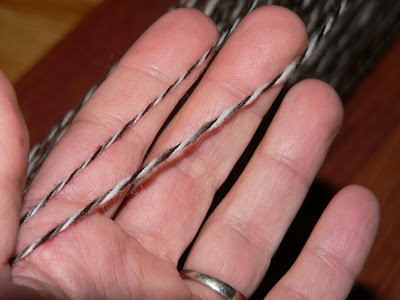 I kept gazing over at the drum carding class, thinking that what they were doing looked pretty fun. 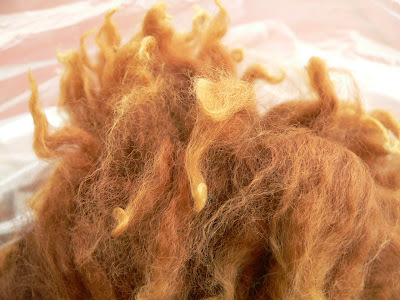 . .
One Suri baby fleece kept calling me back for more touching, as did a wickedly soft bag of baby camel and silk. Guess what came home with me? Back to front: the alpaca (his name is "Espresso Dawn." Hee), a bag of silk cocoons for kid/me experiments, the camel/silk to the left of that, then some green silk hankies, some white silk hankies, some Bombyx top, and two balls of Corriedale. I still don't know if I'm going to ply the Corriedale with the alpaca for a sweater, or spin the alpaca straight from the locks and make a drapey. . . something. Suggestions? But when I get stuck mentally on a project, I tend to do a lot of walking around and thinking. I'm all-but-back done with the Pearl Buck Swing jacket, and since I've added an inch to each front (for my freakishly long torso), I've had to figure out how to do the same to the back. I think I know how -- but I have to get confident enough to actually try it. There's so no way I'm doing a dozen this year. Sigh. And I cast on for a quickie baby sweater for the still very new baby down the street -- and my family is unanimous that it is too small. Instead of ripping and redoing, I'm contemplating giving them a stuffed animal for the baby, wearing a little sweater. Maybe I'll block it like mad. There has, however, been lots of entertainment in the arena of my dreams. This morning, I realized that the princes of England had to be "stacked" before they could assume the crown and rule the country. By the rules, Harry had to be the bottom half even though he was taller than William. I think he may have said, "It's not fair," just like my bunch does. And they weren't going to do the stacking piggy-back, oh no. They were going to be somehow smooshed into the same person. Just two people's worth. Somehow. Then, in the same dream, my spouse presented me with a new laptop. I opened it to find a tiny compartment along the side with a slim silver fork and spoon set. Above the (miniscule) keyboard was an eating plate area. It was a "food-friendly" laptop! I didn't know if he'd bought it on purpose because he wanted me not to eat around the big computer, or just in case I spilled something on the laptop. I thought it was a pretty great idea. I enjoyed the seventh Harry Potter book quite a bit. Thing 1 got it at 3pm on Saturday from the UPS driver (she declined to pose for a picture with him), and at 9:55pm she handed it to me. She came in a few minutes later and said, "Why aren't you reading it?" I was working at the time. I didn't take that opportunity to whine, "It's not fair I have to work first". . . but instead showed her how just a little motivation made the work go smoothly and still left me time to read. Ha. I actually did my work and then stayed up way too long. Good book in any case. Well, because Kate asked, and because I'm still not done with all six pieces of the Pearl Buck Swing Jacket (although I have recovered some knitting momentum), here's that meme. 1. I've grown increasingly particular about the state of my morning newspaper. If I get to it first, I sort it in sections of "must-read" down to "maybe," aligning all edges and folds. If someone else gets to it first, I prefer that they leave it looking as though they hadn't. 2. 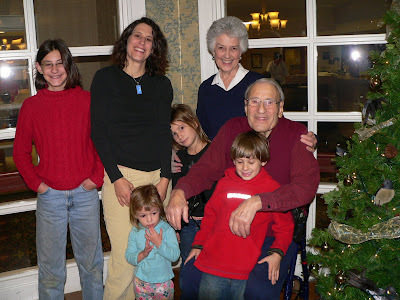 When confronted with a new problem or project, from rearing four incredibly active children to knocking walls out of a house and repositioning them, my first response is almost always, "How hard can it be?" Upon finding out that it can be, in fact, very hard indeed, I am again, almost always surprised. 4. I desperately miss writing letters to people who also wrote back. Email is great, but it destroyed letter-writing; and I have two friends to whom I write -- and one wrote back last month! Have I returned the favor? I have not (yet). 5. The longest I've ever lived without a pet was six months. 6. I have an environmentally indefensible longing for a VW Eurovan Weekender. 7. To my astonishment, I was a cheerleader for one year at my (Southern Baptist in Southern California) high school. 8. I have vivid, weirdly plotted, detailed, often very amusing dreams in color almost every night. And I remember them fairly well. I wonder why my sleep is not more restorative. I'm probably not going to do that, as I think everyone has already done this. Please don't tell the Meme Police. I loved that all of the kids got to be there to greet our Little Missy two years ago, and she's been a treat pretty much ever since. Now she's talking like an adult, nearly done with diapers, and just a funny little person. How time, unlike my knitting, flies. Our annual trip to pick Ollalieberries happened yesterday. As usual, Thing 1 was a picking machine. This is rendered more wonderful by the fact that she doesn't actually like to eat berries. At all. Now those that weren't slapped into little pies are being frozen for future treats. 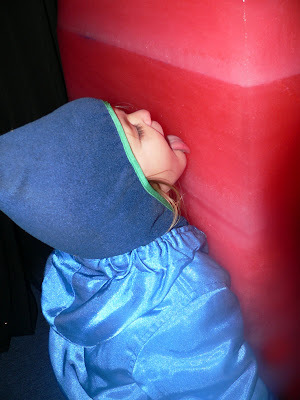 Since we don't have electrical work planned, they shouldn't mold when the freezer is unplugged like last year's haul. The kids wanted to go to the beach, but taking my bunch to the Pacific Coast isn't my idea of a fun time. Give me a protected bay any day. Maybe in a few years, with a rented Newfoundland, we'll make stopping by the beach a part of the berrying tradition, like Suzee and her intrepid bunch. 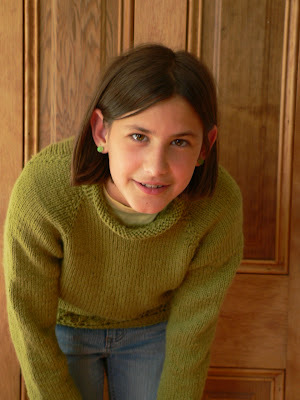 Oh, and I really think I'm going to finish the Green Sweater today. Hooray! If I do, pics tomorrow. I am sick and tired of them taking crap from our yard, turning the hose on without asking, dropping candy wrappers in the yard, etc. And when I said, "Look, I want you to stop doing things without ASKING first," they point at each other and say, "He did it, not me!" I just gave a terrific lecture, titled I Do Not Care Who Did It, Do You Hear Me? I Am Sick And Tired I Do Not Come To Your House And Turn On Your Hose And Borrow Your Toys I Am Speaking To You Individually And Together. I bet they heard "Blah blah blahblahblahblahblah." Now I have to work and I'm still cranky. No knitting and drat it all now the baby is awake from her brief nap and the house, despite me going on numerous "pick it up" runs still looks nothing like it did before they all tumbled out of bed. So I can only surmise that in a few years I will be sitting on my porch, beside my spinning wheel with my cane, yelling at the whippersnappers to stay away from my flower beds. My plan to spend a lazy summer doing nothing but ferrying children and knitting to the lakeshore hasn't yet come to full flower. Okay, it's probably not going to. Today was the county fair, tomorrow is berry picking, and although my course finishes this week, two more begin next week. But that course session ends with my vacation, and I was reminded today at the fair that the bees are going to begin their slowdown for winter now that the solstice is past. So maybe there will be balance someday. Thing 2 is back, and pretty well reintegrated into the family, if sibling bickering and strewn laundry are any measure. She had a fabulous time with the Anything You Want, Dear grandparents, and is now talking about flying to Sweden to visit my brother and his family. I told her that I should probably discuss it with him first. Her bold nature was on display today at the fair, as she and her brother tackled midway rides that had me alternately shrieking, "Hold ON!" and tactfully looking away to take deep breaths. It was a good if hot day. When I looked at the knitted items, I couldn't figure out a type that the judges liked -- they were all over the map, and our opinions didn't match. Of course, I couldn't handle the things, but I would have given the merino/silk handspun a higher score than the novelty handspun. But that's just me, apparently. My bread won second place, so I'll probably bake again next year. It wasn't the best loaf I've ever done; just what was handy. I think I was distracted while I was baking it. The trim for the finished arm is done, the other one should take an evening, then some ribbing around the neck, and I'll move another one out of "draft" into the "finished" column. It may be the last wool I knit with for a little bit, though. I have visions of cotton colorwork dancing in my head. I wonder if everyone uploads all of their pictures first and then sort of writes around them. That's what I do. I get so impatient waiting for them to load that if I get it out of the way first, I can just go on and on and on, the way I so love to do. Blah blah blah lalalala I can't hear you. . . I'm talking so much. At any rate, I learned a bit about spinning and a bit more about me this weekend. 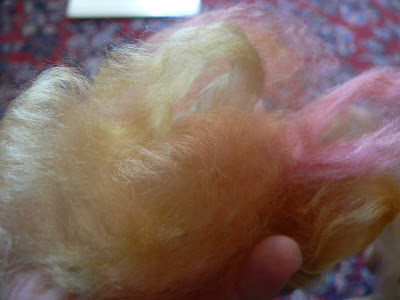 I found out that silk top is a dream to spin. I found out that I sort of like watching the colors change as it runs through my hands and onto the bobbin, even though I don't really like things knitted from painted yarns. I discovered that with a little attention, I could spin fairly fine for me if -- and it's a fairly big if -- I was really patient and split the batt and predrafted it carefully. But I also discovered that the hooks make lumps and the Traveller has sort of jerky uptake. Another discovery? I'm not very patient all the time. I'm especially not patient when I'm tired. Not with me, not with fiber, not with the kids. 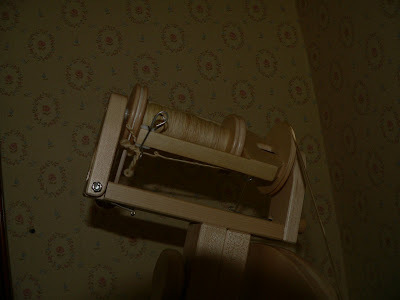 Unfortunately for the silk, that meant that I willy-nilly spun up the second bobbin and got ready to ply faster than was perhaps best. Instead of perfect yarn, with perfectly-plied twist, and matching singles, so the color changes matched up, I got "Party on a Bobbin." The shiny? I like. The few places where the singles are the same size, instead of ranging wildly from wee-and-tight to big-and-loose? I pretty much like. The colors? I like, but more with less of the stripey. What I'm going to do with near-novelty silk (about 60-80 yards) I have no clue. Thing 1 has suggested a hat, but she doesn't actually wear them. She swears she would this one. Maybe. That pea green is a big favorite around here. I've got to figure out how to do that more often. The darker indigo is Japanese; the lighter the Guatemalan. Everything else is indigo over something. And last night I also spun up either the madder or the fustic. 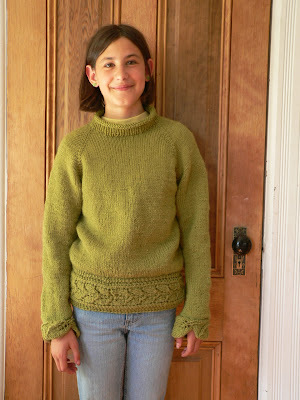 I was trying for a lofty, not too warm yarn, with enough yardage that I could combine it for a wee sweater. I don't think I got there. Fluffy yes, but nothing to knit home about. Heee. 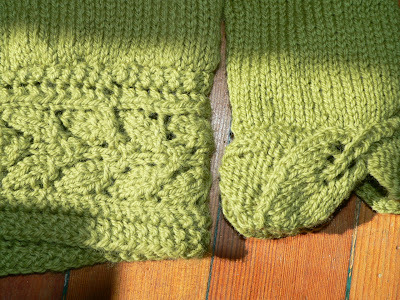 The green sweater has one sleeve all done except for the leaf trim. Just one more sleeve and a neck to go! And that would be, oh, March's sweater? Or is it April? I've so forgotten in the fun of walking around and wondering if I have enough yarn. I should probably call Michael's and see if they have one more ball of this dye lot. Ho hum. It's amazing to me that if I actually hold needles and yarn in my hands and sit for a few minutes, things get done. Another lesson to relearn apparently. Thing 2 comes home tonight. I'm excited, and so are the younger kids. Thing 1 is reserving judgement, herself. Someday she's going to love her sister, I promise. The only trouble I anticipate is at bedtime. 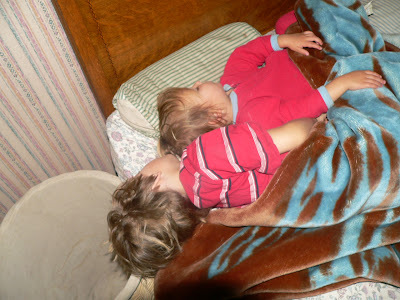 Although the baby's a bed hog, Thing 2's place is in jeopardy.